First step in unboxing anything miniature related is to go through everything and make sure it's complete. Nothing worse than finding out you are short a base, barrel or anything else that makes your job harder in putting this stuff together. Easiest way to make sure it's all there. Just line it all up and it'll make it easier for you to see what's missing. in this case, there wasn't anything missing, the barrels weren't bent and all the bases were intact without any chips in them. 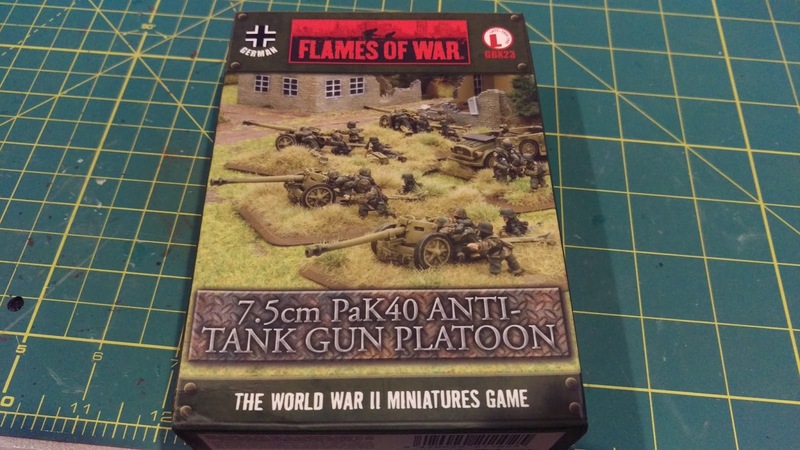 Mix and match any troops that come with your box sets or blisters. It'll break up the uniformity and you shouldn't have any doubles of the same 'poses'. Primed and a first coat of 'Dunkelgelb' applied to the guns. 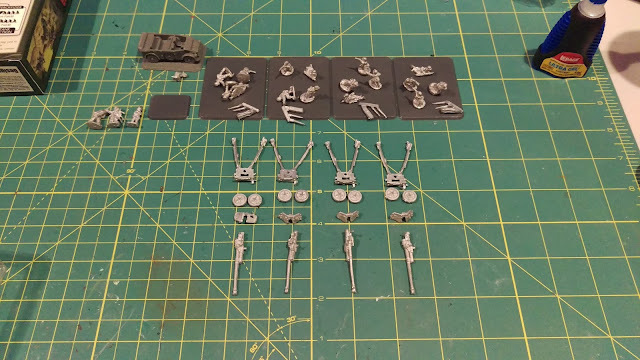 These models are relatively easy to put together, just make sure the glue is completely dry before you start picking these models up to paint. 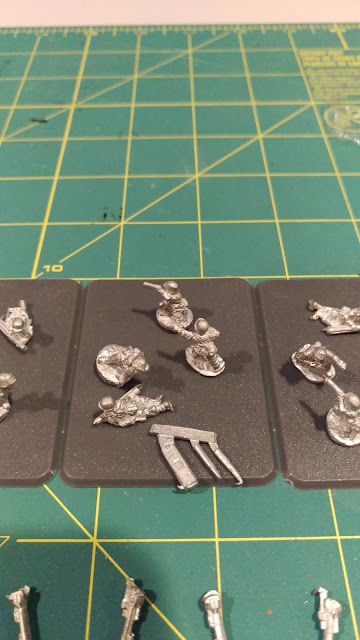 I used a little bit of the Plastic Soldier Company paint I had left, there was just enough in the can to get these guns coated twice and ready for wash, detailing and basing. 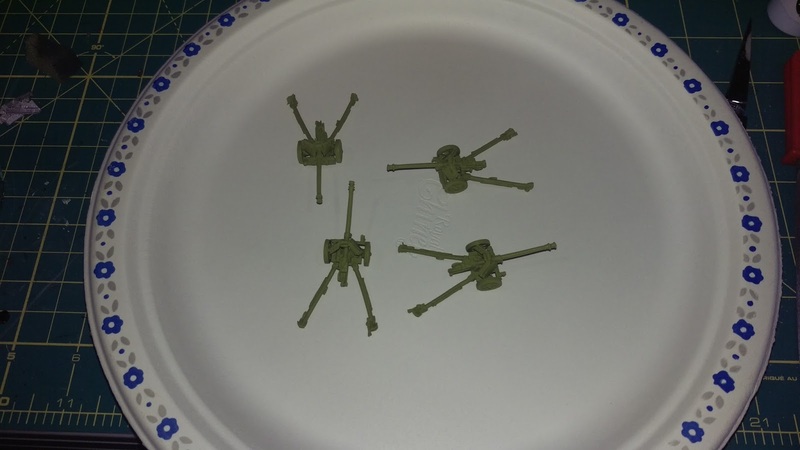 I place all my soldiers first, then lay the guns in place afterwards. Once I am happy with gun placement, I glue the soldier figs to the base. This ensures the guns will fit once everything else is completed. 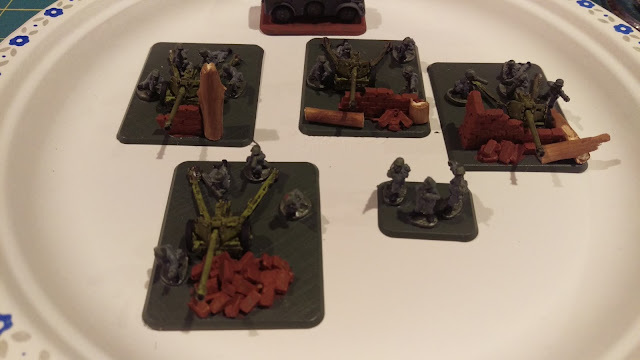 I had some resin brick lying around and I also grabbed some twigs from outside for logs and dead trees for this platoon to hide their intentions. 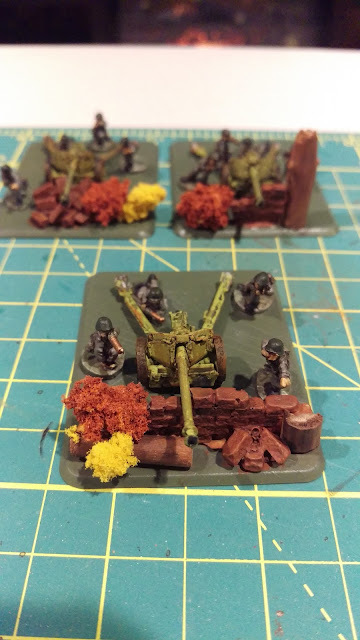 Troops painted, the gun is in it's final spot before I glue it down. It's also the time where I add some tufts and wash and dry brush the brick walls. In this case, I went with bold yellows and reddish brown, this was a nice change from the green I always use with my own models. Stick around and I will have a post showing all the basing and final touches on the command stand and the vehicle that came in this boxed platoon.